It’s the calling card that Anonymous has signed-off their online assaults with since the start of their Internet crusades. As the hacktivists continue to come down hard on the websites of corrupt corporations and governments, they’re offering the warning once more. Anonymous is cautioning future targets something that they think should have been clear of awhile ago: they’re serious. Following a series of highly-publicized attacks on the websites and computer networks of government and private sector entities across the globe, operatives allegedly involved in the hacking collective Anonymous announced that their ruthless assaults and raids will not cease. Campaigns will continue, says the group, and they will carry on with revealing the results of their handiwork every week. In a post published to the AnonOps Communications website over the weekend, a spokesperson for the group insists that the attacks that have come every Friday during the last few months will continue for the unforeseeable future. 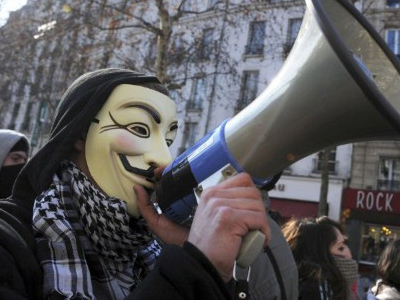 “Each and every Friday Anonymous will be launching attacks… with the specific purpose of wiping as many corrupt corporate and government systems off our Internet,” reads the message. Although the group cites no leader, affiliation or organizational structure, the AnonOps Communications blog has served as a central hub for communiqué of sorts for the group. In addition to tweets and postings from individual operates, the AnonOps site has detailed, discussed and confirmed Anonymous-related attacks in the past. According to the recent posting, those assaults will only continue despite the group becoming a household name as of late due to their attacks on international governments. 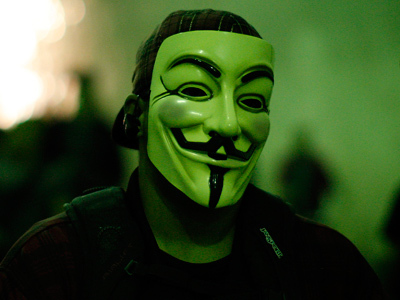 Even with warning targets in the past that they will be victimized with online assaults, Anonymous has still remained at large. An alleged member speaking on condition of anonymity to Wired.com says, “We are already sitting on dozens of unreleased targets” and that assaults will continue until things change. In recent weeks, the group has gone after a wide-range of targets across the globe, which they say have engaged in unethical, immoral or otherwise downright devious activities. 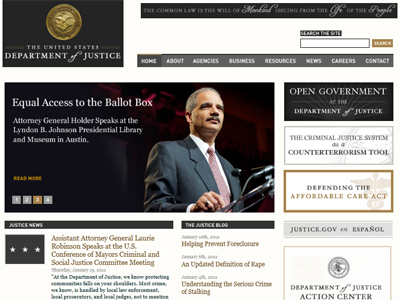 Websites affiliated with the US government in one form or another have become popular targets, and during 2012 the group has rehashed a campaign used previously called FuckFBIFriday, or FFF. As part of the campaign, the group has gone after different federal entities and released their damage at the end of the workweek. Targets in 2012 alone that have been comprised due to Anonymous-engaged activities include the CIA, the US Copyright Office, the police department of Oakland, California, Universal Music Group and the FBI. Even after crippling those sites and, in some instances, defacing them and hacking into private data on their servers, the group seems all but unstoppable. To Wired, the Anonymous member confirmed that the collective shows no sign of stopping. 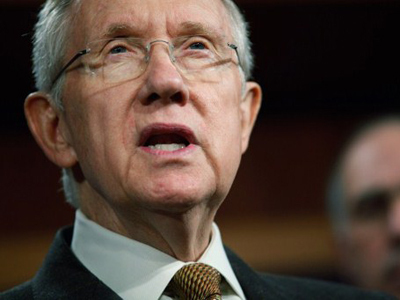 Though the group has remained active in the underground for several years, they received notoriety in early 2012 for helping expose a congressional legislation in waiting, the Stop Online Piracy Act, or SOPA. Although the act has since gone into hibernation, Anons have said that they intend on fighting the US government if they continue to try to keep the Internet from being an open medium for communication and innovation. “This is a war they plan on fighting until the end and so do we,” Project PM founder and occasional Anonymous collaborative Barrett Brown told RT. 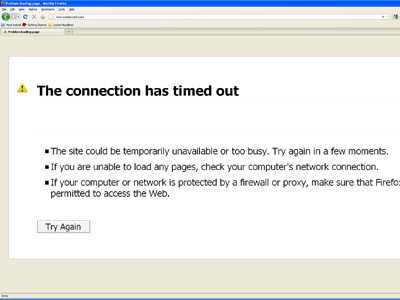 Responding at the time to SOPA and the federal raid that shut-down online file sharing site Megaupload, the group ravaged the websites of the US Department of Justice and others. 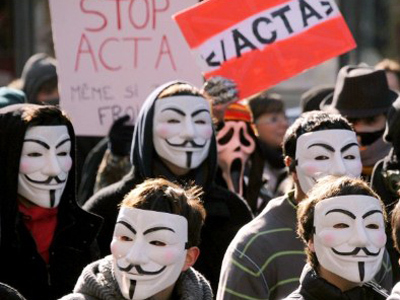 With the in-the-works ACTA legislation causing concern from Internet activists only weeks after SOPA was stopped, the group is once again ready to engage in a battle with whomever it must take on.